Not every engaged couple is interested in following the traditional, formal rules of wedding etiquette. However, those who are want to be certain they are doing things correctly. It might seem that putting wedding invitations together would be a simple task, but when an invitation includes response cards, maps and other information, it can get confusing. Fortunately, it is possible to do this task correctly by following a few guidelines. Lay the inner envelope, the envelope that directly holds the invitation, in front of you with the invitees' names facing down and the open flap pointing to the right. Slide the invitation into the envelope. The front of the invitation should face the back of the envelope so it is seen when the envelope is opened. Place the mailing envelope so you are looking at its back and the open flap is pointing to the right. 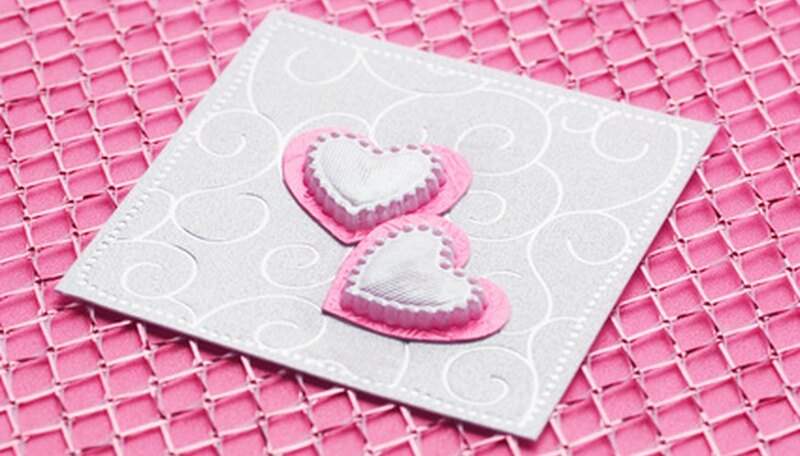 Holding the invitation, cover the names of the invitees with protective tissue paper, if it has been provided. Tissue paper is not required. Place the invitation into the mailing envelope with the front of the invitation's envelope facing the back of the mailing envelope. Place other enclosures, such as response cards, on top of the invitation, according to size with the largest enclosure first. Stack each envelope facing the same way as the invitation. Seal the mailing envelope. To reduce smudges, wait until all the envelopes are filled and sealed before addressing them. Invitations should be mailed six to eight weeks before the event. At the post office, you can request that the invitations be "hand-canceled" to prevent them from being marked or damaged by machinery.